2019 Kerry Senior Football Club Championship. 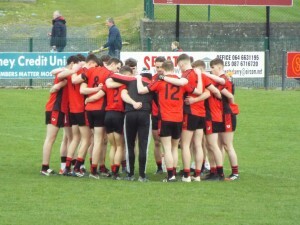 Our first outing in the Senior Club Championship took us to Lewis road in Killarney where we took on recent All Ireland Intermediate Champions Kilcummin. After a closely fought battle Kenmare won on a score line of 1-13 to 0-15 points. We now face Dingle and Austin Stacks in this Group 1 division. Kenmare Shamrocks Weekly Lotto Draw. Our current lotto jackpot is €8,100 and still growing! Weekly tickets can be purchased from local businesses in Kenmare town. You can also play online by visiting our Kenmare Shamrocks GAA Facebook page and clicking on the blue ‘Play Game’ button. Results for 7th April Jackpot €8,100. Kenmare Shamrocks GAA Club member registration is now open ONLINE for 2019 season. Just go to the Kenmare Shamrocks web page on www.clubforce.com and fill in the details. Our club registration day will be announced shortly. On behalf of Kenmare Shamrocks GAA Coiste na nÓg and Kenmare Cycling Club, we would like to thank everyone who took part in our charity cycle last Saturday. It was a very successful event and is getting more popular as the years go on. Congratulations to the 5 winners of the ‘Golden Tickets’ which enters them into the Ring of Beara cycle on the 25th May. A huge ‘Thank You’ must go to the committee members who organised this event and to all the volunteers who helped out on the day. Why not join our Facebook page ‘Kenmare Shamrocks GAA’ and stay up to date with all our clubs fixtures, results, lotto and fund raising. We are also on Twitter and Instagram @kenmaregaa.